We define superzoom cameras as any model with an optical zoom of greater than 20x. Within this category you will find many different styles ranging from compact pocket-sized to larger full body versions due to the size of the lens. The price range also varies from about $200 up to about $1500. If you want that mega-zoom lens in the 30x, 40x, 50x, or more than you came to the right place. If you are looking for other specific type of cameras perhaps you would be more interested in compact, waterproof, or cheap cameras. Below we review our choices for the top 10 best superzoom digital cameras. If you want to compare specs on each model see our comparison chart at the bottom of this article. We selected the Sony DSC-RX10 III as the best superzoom digital camera. This spectacular DSLR alternative is expensive, however, since it sells for $1598. The RX10 III provides amazing image quality thanks to its 20 MP 1-inch back-side illuminated sensor and BIONZ X image processor. The 25x optical zoom Zeiss lens is similarly amazing. The DSC-RX10 III is built well, offers speedy performance – up to 14 FPS, has a bright OLED viewfinder, and provides quick image sharing via Wi-Fi or NFC. The video capture is also second-to-none with full 4K recording and super slow-motion of up to 960 fps. Other than being expensive, the only other real negative is that is fairly large and heavy – at 38.6 ounces it is the heaviest on this list. Overall, if you want the best high-zoom camera you can buy without getting a DSLR and don’t care about price then the Sony DSC-RX10 III is perfect for you. The $849 Canon Powershot G3 X can compete with the much more expensive Sony RX10 III. The main differences are slightly worse optics, no 4K video, slightly slower, lighter, and no built-in EVF (however, you can buy one separately). The G3X still has very good image quality – probably better than every other camera on this list – due to its 20 MP 1-inch sensor and DIGIC 6 image processor. The 25x f/2.8-5.6 optical zoom lens is excellent as well. Users have plenty of controls, dials, and a touchscreen to setup the camera exactly as you wish. This Canon camera shoots 1080/60p video and includes both a mic and headphone jack. There really isn’t any major drawbacks to the G3X, but there a few minor ones. The auto-focus speed is average for this price range and burst rate in RAW/RAW+JPG mode is a bit sluggish. Overall we recommend the Canon Powershot G3 X for buyers who want the best camera for under $1000 and who don’t need 4K video. If you want the highest zoom then you should consider the unequaled 83x zoom of the Nikon Coolpix P900 which sells for about $570. With a 16 MP 1/2.3 inch sensor the image quality does not quite compare to the more expensive Sony and Canon models, but is still really good. The P900 has excellent image stabilization to shoot at long focal lengths. The Nikon Coolpix P900 has full manual exposure controls, built-in Wi-Fi, NFC, and GPS. Video capture is fully automatic in 1080/60p. On the downside it does lack some features that more advanced users might desire like RAW capture or a hot shoe. When fully zoomed in the images have some noticeable noise reduction which can mean a lack fine detail. Due to the large zoom lens, it is also a bit on the heavy side at 32 ounces. Overall the Nikon Coolpix P900 is for any buyer looking for the longest zoom possible like birding and wildlife photographers. The Panasonic Lumix FZ300, $498, has an excellent 24x constant f/2.8 25-600mm lens for great low light photography through the whole zoom range and a body that is weather resistant for use in the rain. The 12 megapixel 1/2.3-inch MOS sensor provides surprisingly good image and video quality. Other positive features include fast performance including AF and 12 fps burst shooting, solid OLED EVF, 3-inch rear display with with tilt and swivel capability, Wi-Fi, 4K video and 4K photo modes, and RAW image capture. There are other cameras that have the same sensor and zoom capabilities in a smaller camera body, but they don’t perform as well as the Panasonic Lumix FZ300 thanks to its lens. Overall the FZ300 is a solid choice for those who want excellent image quality and want to shoot 4K video all for under $500. We really like the Canon PowerShot SX720 HS as a great compromise between price, performance, and size. At $349 it is relatively cheap for a 40x zoom camera all the while being the lightest and most compact superzoom model on this list. Image quality really doesn’t suffer despite the price either – it might be just a notch below the 1-inch sensor models with its 20 MP 1/2.3-inch CMOS sensor and DIGIC 6 image processor. Other features include built in Wi-Fi and NFC, decent image stabilization, and full 1080 60p HD video with stereo sound. Burst shooting up to 5.9 fps or 4.6 fps while utilizing continuous AF is a bit below some of the more expensive models in the class. One area that the SX720 HS does struggle a bit is in low light conditions with a high zoom. However, at $350 the Canon PowerShot SX720 HS is maybe best value compact superzoom camera you can buy. If you are looking for a cheaper Sony megazoom camera then the Sony HX400V might be for you. With a price of around $450 it is around one-third the price of the DSC-RX10 III while retaining many of the same positive features. It forgoes the 1-inch sensor for the more common 20 MP 1/2.3-inch backside-illuminated CMOS sensor, but does still have the speedy BIONZ X image processor. The 50x optical zoom Ziess lens has a bright f/2.8 at wide angle to a much dimmer f/6.3 at telephoto. The HX400V is capable of shooting 24p or 60p 1080 HD video. It has Wi-Fi and NFC, GPS, speedy AF and performance at 10 fps, decent viewfinder, and an easy-to-use function and navigation system. The negative for the Sony HS400V is that the image quality, as with virtually all 1/2.3-inch sensor models, can degrade and become noisy in low light or at increased zoom. Overall we would not hesitate recommending the Sony HX400V. The $470 Canon PowerShot SX60 HS boasts a powerful 65x zoom lens with 21mm wide-angle coverage. At its heart is a 16 MP 1/2.3-inch BSI CMOS sensor combined with a DIGIC 6 image processor. With decent lighting the image quality is very good. Other nice features include 6.4 fps continuous shooting, RAW support, NFC and Wi-Fi, electronic viewfinder, 1080p 60fps HD video, and 3″” fully articulated display. Unfortunately with an aperture of f/3.4 at wide and f/6.5 at telephoto low light performance suffers. 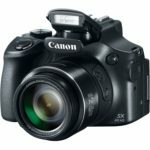 We recommend the Canon PowerShot SX60 HS for anyone looking for a superzoom lens of over 50x and who don’t want to spend more than $500. The $450 Nikon Coolpix B700 is Nikon’s newest high-powered zoom digital camera. It provides users with a 60x optical zoom Nikkor lens with a 20 MP backside-illuminated 1/2.3-inch CMOS sensor that provides very good image quality. Some of the other B700’s features include RAW shooting, 4K 30p video, EVF, Wi-Fi and NFC, and 5 fps continuous shooting. Buyers should be aware the B700 charges via a micro USB. Also photos in low light and at high zoom will result images that are less sharp. Overall the Nikon Coolpix B700 is a solid camera and a decent choice for someone who needs a 60x zoom combined with RAW and 4k video. Another lightweight and compact megazoom camera is the Panasonic Lumix DMC-ZS60 which sells for just under $400. This model comes with a Leica 30x optical zoom lens and an 18 megapixel, 1/2.3-inch High Sensitivity MOS sensor and Panasonic’s Venus Engine image processor. This results in quite good image quality in well-lit areas, but worse performance in lower light settings. Positives include 4K Ultra HD video, compact size, EVF, touch-screen LCD, and user-friendly features like Post Focus. It takes 5 fps in burst speed, has no hot shoe for accessory flash, and the image quality degrades noticeably in poorly lit areas. The Panasonic Lumix DMC-ZS60 is for those of you who want a compact, high-zoom point-and-shoot camera that is capable of 4K video all for under $400. 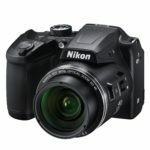 If you want a cheap superzoom camera then you should consider the Nikon COOLPIX B500 which sells for under $260. The B500 offers a 40x optical zoom f/3.0-6.5 lens with a 16MP 1/2.3-inch BSI CMOS Sensor. It includes lens shift vibration reduction which helps when at high zoom and for lower light shooting. The image quality is decent, but like most cameras with sensors this size the quality drops in darker settings. Some other features include Wi-Fi and NFC connectivity, 3″” tilting LCD, 7.4 fps continuous shooting, and full 1080p 30 fps HD video. Buyers should be aware that it uses 4 AA batteries for power and has no viewfinder. Overall the Nikon COOLPIX B500 is a good choice for those of you who want a cheap high-zoom point-and-shoot camera.